Buckeye Valley’s Dani Grether (5) looks for an open teammate during the first half of Thursday’s non-league showdown against visiting Johnstown. Lauren Layman (13) and Ashley Schneider (12) were defending for the Johnnies. Confidence can be a powerful thing and the Buckeye Valley girls basketball team is feeling real good right now. 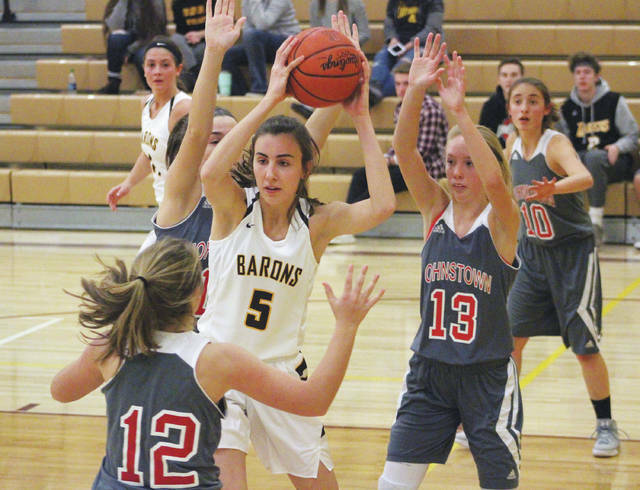 A couple of days after the Barons picked up their first win over MOAC rival North Union since 2007, they dominated Johnstown-Monroe 67-25 in non-league action Thursday night in Delaware. Senior Lisa Leienberger had a big night for the Barons, scoring 14 points and adding five steals. She had two free throws and a put-back in the early going of a 20-0 first quarter. The Johnnies finally got on the board at the 7:46 mark of the second quarter on a pair of Ashley Abner free throws. But, the Baron defense was stifling. They held Johnstown without a field goal until Lauren Layman’s three-pointer with about 38 seconds left before the half. By that point, BV had built a 36-5 lead. Morgan Scowden finished with a game-high 17 points, Tess Hughes added nine points and 12 rebounds and Dani Grether chipped in eight points for the Barons. “We haven’t lost a rebounding battle yet … and that was one of the goals the team has set,” Stout said. Lauren Hursey finished with six points to lead the Johnnies (3-5) and Abner and Layman added five apiece. BV is off until Jan. 3 when it travels to Hebron Lakewood in non-league play, scheduled for a 7:30 p.m. tip. The Golden Eagles never quite got going Thursday night, falling behind 18-4 by the end of the first quarter and 42-14 by the break on the way to an OCC-Capital Division loss to the visiting Wildcats. Big Walnut (5-4, 1-3) started the second half with a bit of a surge, outscoring Newark (7-0, 4-0) 19-7 in the third, but couldn’t maintain the momentum in the fourth. Katie Cochran led the Eagles with 10 points while Erin Boehm finished with eight and Avery Schone and Paige Norman chipped in six apiece. Newark’s Morgan Sharps, meanwhile, led all scorers with 23 points. Big Walnut returns to action today against host Johnstown. Delaware Hayes 39, Dublin Scioto 34.